Brendan Reilly, M.S. ’11, isn’t an NFL coach. But when the NFL season kicks off this weekend, Reilly and his big idea—his creation—will impact how some of the league’s biggest stars play the game. 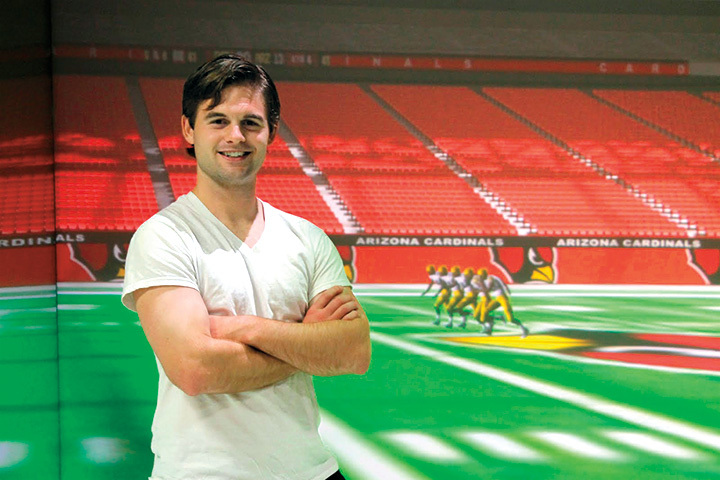 The Illinois State alum is co-founder and CEO of EON Sports VR, which recently added three NFL teams to its list of clients using its virtual reality (VR) football simulator. Just a few years after hatching the idea as an Illinois State student, Reilly and his company are now industry leaders in sports VR. That’s exactly what he’s done. Since Reilly was featured in Illinois State magazine in 2013, his company’s technology has been bought by hundreds of high schools and 10 college football programs. Most players use a special headset to turn their smart phones into a portable, anytime VR simulator, running software that’s like a full-speed, fully customizable version of a Madden video game. This summer, the Tampa Bay Buccaneers became the first NFL team to announce plans to use EON’s Sidekiq software as a supplement to their on-field work for quarterbacks, including rookie Jameis Winston. EON’s jump into the NFL lead Reilly to appearances on ESPN and publications such as USA Today and Fortune. 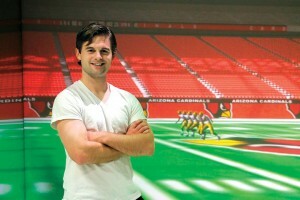 Illinois State alum Brendan Reilly, co-founder and CEO of EON Sports VR. “The virtual reality technology that has been introduced by EON is a technological breakthrough that will change the way many coaches and players, at all levels of football, will approach game preparation,” Buccaneers Chief Marketing Officer Brian Killingsworth said in July. One of the reasons that NFL teams want to use VR is because they don’t have as much training and teaching time with the players as they used to, due to the league’s collective bargaining agreement. Another change that’s sped EON’s growth is the rapid improvement of smart phones. Just a few years ago, EON’s technology was confined to costly, fully immersive VR rooms that surrounded players with display walls. That ICube technology still exists, but the headset/phone combination has changed everything. Reilly, 28, earned his master’s degree from Illinois State’s sport management program in the School of Kinesiology and Recreation. When Reilly came to ISU in 2009 to work under then-basketball coach Tim Jankovich, he was already on the fast-track to becoming a head college coach himself someday. “It was then when I realized I liked the business side of sports more than the actual game itself,” he said. Next up for Kansas City-based EON: expansion into other sports. Reilly’s heavy travel schedule has included several visits with professional baseball teams. After years of selling the idea, pro teams are catching on. Now it’s all about selling Reilly’s platform. Learn more about Illinois State’s many all-star alumni who’ve found off-the-field success in sports.